A golfer’s game depends on good decisions with every shot. Performance data, captured and analyzed in realtime, can help players improve their skills mid-game and make better decisions throughout the course. 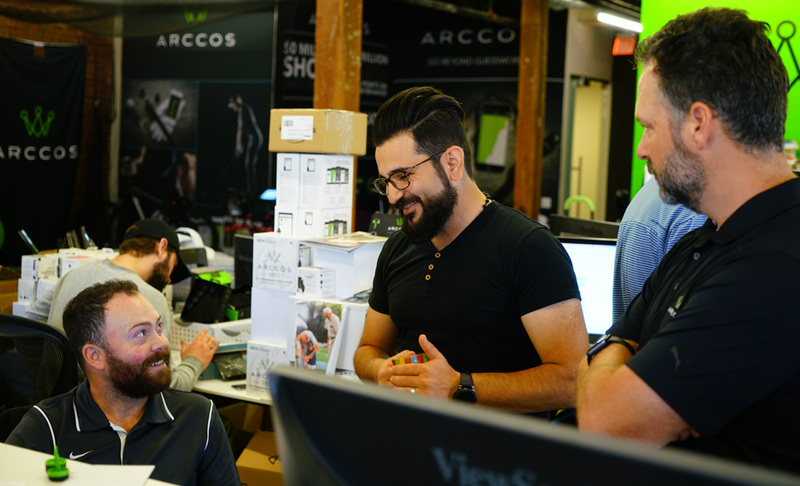 As the field of connected sports gains momentum, Arccos Golf is using today’s innovative IoT and mobile technologies to re-invent one of the world’s oldest games. The company’s innovative shot-tracking system pairs small, ultra-light golf club sensors with a mobile app and analytics platform. Using GPS and Bluetooth, Arccos automatically captures data on every shot, analyzes a player’s strengths, weaknesses, and trends, and delivers feedback through the mobile app in realtime. Such data-driven insights can dramatically improve a player’s ability to make the right decisions at every hole. In order to deliver on their vision, Arccos needed to provide a fast, seamless user experience with zero disruption to the player’s golf routine. Their system had to handle significant data flows from sensor data capture and analytics processes, as well as from rendering detailed course maps and a rich UI—all in realtime. Because users expect apps to function wherever they are, the Arccos mobile application needed to work on remote golf courses where mobile connectivity may be unreliable. Originally, Arccos outsourced the development of an Android app that took a traditional approach. The app used RxJava and OrmLite, SQLite. However, the performance for this model was unacceptably low and the Arccos development team had to persist data as JSON blobs as a workaround. To translate data between models and keep it all in sync, the Arccos development team had to write a massive amount of code. This meant significant time spent debugging and maintaining code, which distracted the team from focusing on new development. Arccos users experienced frustratingly slow app performance, which inhibited their ability to get the most out of it. Arccos knew that they had to re-architect their system in order to make it more efficient and sustainable. Arccos decided to explore a simplified data solution using Realm, and they started by building a proof of concept to evaluate this new approach. The development team was initially impressed with how quickly they could get Realm up and running — no lengthy boilerplate code or set up processes needed. More importantly, switching to Realm resulted in a significant increase in transaction speed. Arccos found that Realm’s reactive architecture enabled a fast, responsive user experience, regardless of network connectivity. In the golf course environment, offline usage is critical. The team was particularly happy with Realm’s support for offline-first use cases. Realm persists data locally on device, which enables users to access all app data while offline. Realm’s single data model allowed Arccos to simplify their system architecture, streamline app code, and more easily improve stability. Because app data is stored as objects, the database didn’t “get in the way” and distract the team with tedious data translation tasks, making it much easier to implement a pure object model that worked well for their application. In addition, Realm only pulls into memory the parts of the object that you actually need or are actually touching. This effectively spreads the transaction time across user actions ensuring a seamless experience for the user. Using platform tools, such as the Realm Browser, the Arccos team found that they were able to discover and troubleshoot bugs much faster. The browser helped Arccos ensure that their objects were structured correctly, see the one-to-one mapping across objects in memory and the database, and quickly identify any issues. Ultimately, migrating to Realm has been a game-changing decision for Arccos. Players now experience a highly responsive app that works well on a remote golf course. The development team can now move faster and spend more time building new ways to help players become better golfers.